I love a good ghost story, me. Poltergeist, The Woman in Black, anything by MR James. And I love a good ghosty romance too. Truly, Madly, Deeply, The Ghost and Mrs Muir, the episode of Corrie when Jack Duckworth dies. What I can't quite work out is whether A Ghost Story is a good ghost story, a good ghosty romance or... not good at all. Certainly there's no denying it's a ghost story. 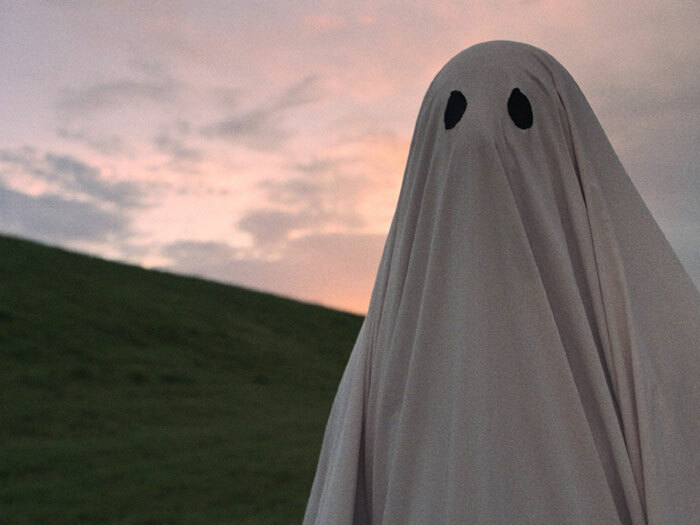 When Casey Affleck's character is killed in a car crash, he arises from the slab to find himself an all-American Hallowe'en costume spook, shrouded under a sheet, with ragged, round eye holes through which he mournfully peers, like something out of Charlie Brown. This sad figure, oddly expressive with his deep-set hollows for eyes and wearily creased face, seems condemned to haunt his former home and the girl he left behind, played by Rooney Mara. Dolefully, powerlessly, he watches her grieve, eat a pie, listen to music and, eventually, move on. Next come a family; they only speak Spanish, so our poor ghost is even further isolated. Then, just as you think things can't any more depressing, he finds the house taken over by a hipster party at which the kind of dickish guy you always get a parties expounds his dickish theories about the utter futility of all human endeavour. Thanks for that. You see, let's not beat about the bush here: being a ghost is incredibly boring. 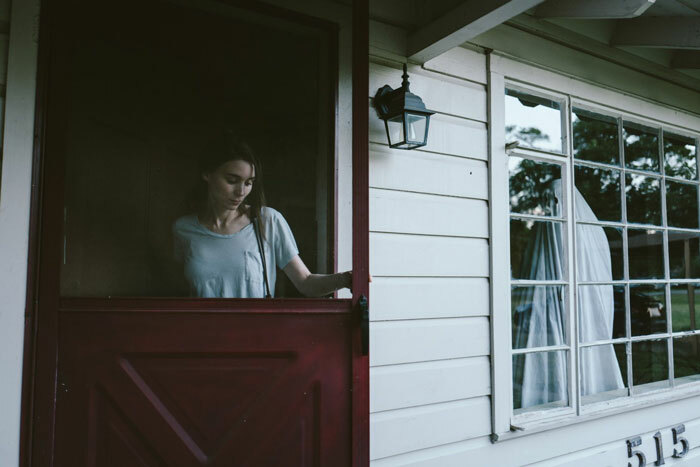 Until she ups and leaves him, our lonely phantom spends most of the time waiting around for Rooney Mara to get home, perking up at the sound of her key in the lock like some unloved pet, only to be cast down again as she ignores him completely. And yes, this means that much of this film is bone-achingly dull. For much of the time, pretty much nothing happens. The pie eating sequence takes ten minutes. Ten whole minutes. Of Rooney Mara eating a pie. At one point, WE LITERALLY WATCH PAINT DRY. And yet... and yet there's something almost hypnotic about it, a masochistic pleasure to be taken in the mind-numbing levels of tedium. Moments of sudden, stark beauty and aching sadness and loss creep up on you; suddenly you are ridiculously moved, where two minutes beforehand you were contemplating walking out. And what does it all mean? Is the film an elegy on the tedious, fleeting pointlessness of human existence, flitting by us even as we cling to it, as hopeless as ghosts under floral bedsheets? Or a kick up the arse, a stark reminder to make the most of life, because it's precious and short, and we're a long, dull time dead?